How was this image of the sun taken and what does it show? 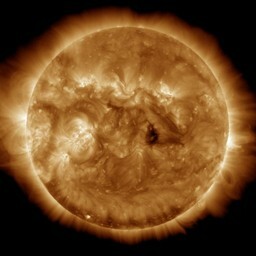 In the last few years amazing images of the sun have been around. 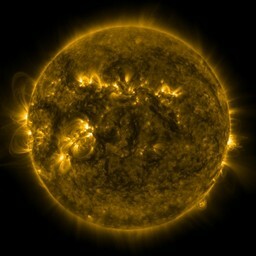 They are from the Solar Dynamics Observatory's AIA instrument. The one below shows super-hot iron atoms. 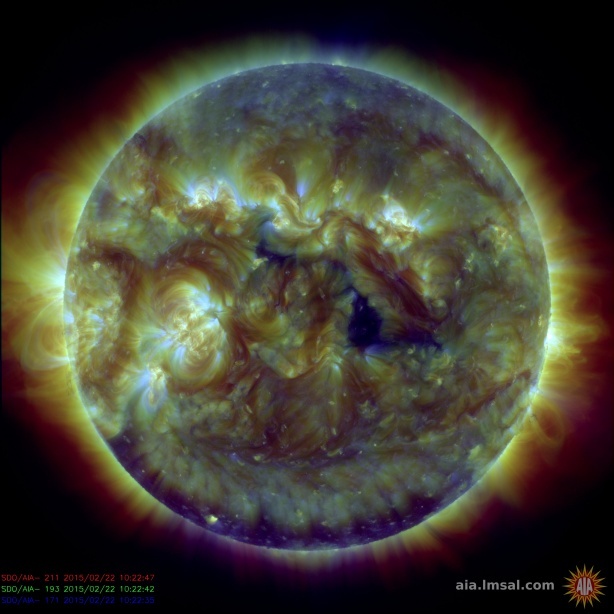 So, am I looking at field lines of the sun's magnetosphere? The light is in the extreme ultra-violet range and was collected through filters. What are those filters made of? What is the exposure time for these photos? Does the unit use the kind of light recording surface a digital camera does, or is it a surface capable of recording in the EUV range? The composite image cannot be made from our standard jpegs as they are log-scaled to improve the contrast. You put the linearly-scaled data into the color channels of an sRBG image and then log scale the result. The AIA instrument filters are multi-layer metallic filters deposited on glass mirrors that were ground to the right shape. All is explained in Lemen's article that is freely available at http://adsabs.harvard.edu/abs/2012SoPh..275...17L . Other articles describe the calibration and operations. A front filter keeps out the visible light in most channels. The CCD is not greatly heated by the radiation that gets through the filter but is cooled by a radiator pointing towards space. What are those filters made of? I have no idea. They're multilayer-coated optical filters that let through incident light in wavelengths as described above. I presume they're high quality and were really expensive though. :) My best guess would be they were made by multiple vacuum deposition layers of partially reflecting dielectric compounds on a glass substrate. This would be the so-called "traditional coating", but there are other processes that could have been uses for AIA. What is the exposure time for these photos? If you look at individual channel timestamps in the image, they're at most a few seconds apart. AIA is capable of taking at least one image each second. But changing optical path (AIA uses four telescopes) and filters will take a few seconds, which will reflect in timestamps. And each filter will likely require slightly different exposure times. The browse data you're looking at (Level 2) are processed from raw (Level 0) data stream and corrected to a standardized exposure time. 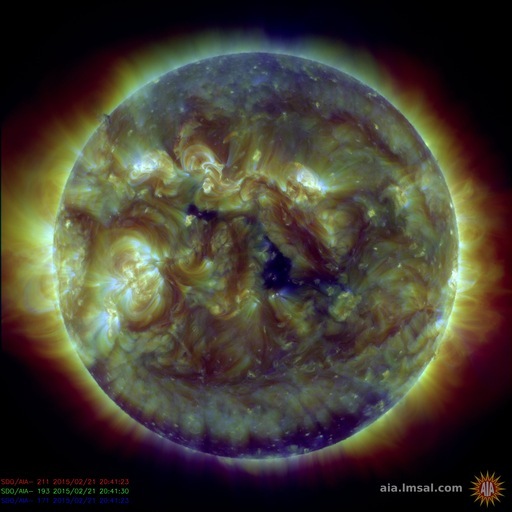 Refer to the Guide to SDO Data Analysis documentation for more info. Does the unit use the kind of light recording surface a digital camera does, or is it a surface capable of recording in the EUV range? AIA uses 4Kx4K resolution CCD (Charge-Doupled Device) sensors that operate at about -70° C (source). Keeping sensors at low enough temperatures enables them to record in visible and UV range with low thermal noise. CCDs are a bit expensive to make, and you'd usually find cheaper CMOS sensors in your consumer grade appliances. But they are widely used in various professional markets, including astronomy. Not the answer you're looking for? Browse other questions tagged the-sun imaging space-weather solar-dynamic-observatory or ask your own question. Does the Sun actually move on its own, or does it move with the Solar system? Why is there a purple dot in the middle of this EPIC image? Is this really an image of the sun, or an “artist's conception”? 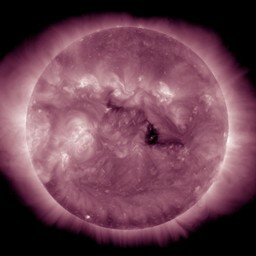 What is this white dot and strange line in SOHO image? What information exactly was necessary to determine and announce this “debris causing event”? What is happening in this photo of a glowing plume behind STS-70 and how was it taken?